Today is Delhi Day, which commemorates the actions of the Sirmoor Battalion (later to become 2GR) in 1857 at Delhi during the Mutiny in the Bengal Army. 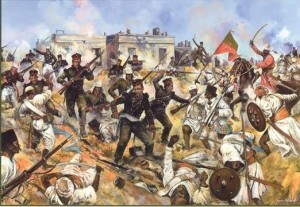 The Siege of Delhi was one of the decisive conflicts of the Indian rebellion of 1857. 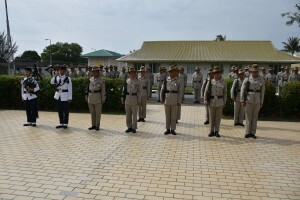 1 RGR, A (Delhi) Company celebrated its ‘Battle Honour, The Delhi Day’ this morning at Tuker Lines in Brunei. All Company members including families were present in this parade. In June 1857 The Sirmoor Battalion of Gurkhas was posted to hold the Main Picquet at Hindu Rao’s house, which was the key to the British position during the siege of Delhi during the Sepoy Rebellion. For three months and twelve days, the Regiment, together with the 60th Rifles (now The Rifles) and the Guides, held their positions without relief. Throughout the long hot summer they were continuously under fire and repulsed no less than twenty-six separate attacks. On 14 September the assault on the city commenced and the Regiment under its Commandant, Major Charles Reid took part in this assault.Out of 490 all ranks engaged before Delhi, the Regiment lost 327 killed and wounded. 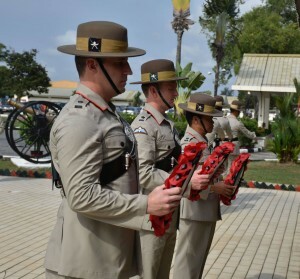 In commemoration of this gallant service, the Regiment received the Battle Honour “Delhi 1857”; the distinction of carrying a third Colour, later replaced by the Queen’s Truncheon, the privilege of becoming a Rifle Regiment and calling its sepoys “Riflemen”; the distinction of wearing the scarlet facings of the 60th Rifles and becoming affiliated to that Regiment. During the attack on the Kashmir Gate, a small party of Bengal Engineers, under Lieutenant Duncan Home, packed explosives under the gate. A firing party of the 52nd Regiment covered them as best it could, but half of the exposed sappers were killed. Lieutenant Philip Salkeld was mortally wounded, but Sergeant John Smith managed to touch off the explosion that blew a hole in the gate through which stormed the attackers, including The Kemaoon Battalion of Gurkhas. Home, Salkeld and Smith were all awarded the Victoria Cross.